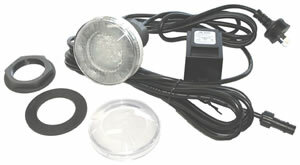 For complete order details on the PAL-2SP and PAL underwater light accessories available, click here. 1. Locate the position for mounting the PAL-2SP fitting to obtain the best light spread in the spa and if possible on the opposite wall to the jets. The fitting should be placed 150mm to 200mm below the water level or 250mm to 300mm below the top of the spa. 2. Drill a 55mm mounting hole (50mm to 58mm) at the selected location. After the hole is cut out, clean the area around the hole to remove rough spots and dust. 3. Fit the PAL fitting in the hole ensuring the rubber seal is fitted between the back of fitting and the spa wall as shown in the diagram. Place a bead of silicon between the nut and the wall then tighten up the nut firmly. 4. Plug in the transformer to the selected GPO. Ensure the GPO and transformer are installed to comply with AS3000. 1. Lower the water level to expose the PAL-2SP fitting. 2. Remove the clip-on lens cover and Dress Ring and unscrew the (6) six lens screws to unclip the lamp from the lamp socket as shown on the Assembly drawing. 3. Replace the Lamp. Note: To ensure reliable operation of your PAL it is essential to use a genuine PAL-2SP Lamp Replacement kit part no. 39-2DL20 or BAB/CG 20 watt Halogen Lamp with UV Cover Glass. When the Lamp is replaced it is recommended to maintain the water tight seal that the "O" ring be also replaced, the "O" ring seal is supplied with the Lamp/Seal replacement kit. 4. When reassembling the PAL-2SP fitting ensure the "O" ring is sitting correctly and replace the (6) six lens screws.